​The United Nations’ independent human rights experts – otherwise known as ‘Special Procedures’ – are considered by many to be, in the words of then United Nations Secretary-General Kofi Annan, the ‘crown jewel’ of the international human rights system. From their first appearance in 1967, when the United Nations Commission on Human Rights established an Ad Hoc Working Group to inquire into the situation of human rights in southern Africa, the Special Procedures system has developed into one of the international community’s most important tools for promoting and protecting human rights. Today, the United Nations human rights system boasts over fifty active Special Procedures mandates, covering a wide-range of thematic and country-specific issues, with more in the pipeline. 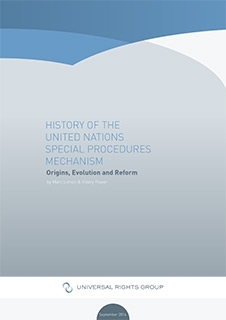 This report on the origins, evolution and reform of the United Nations’ system of independent human rights experts offers an overview of the development of the Special Procedures system over time, and provides a full timeline and exhaustive list of all Special Procedures mandates established between 1967-2013. It expands on research conducted by Marc Limon and Hilary Power in the context of the preparation of the Universal Rights Group – Brookings Institution Policy Report ‘Special Procedures: Determinants of Influence,’ authored by Marc Limon and Ted Piccone and published in March 2014.